Choose from a variety of wire rope Cable End Fittings manufactured from 316 marine grade stainless steel which guarantees decades of corrosion resistance and beauty. SC&R offers proprietary design at the best prices to match your architectural handrail project. 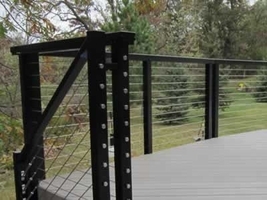 SC&R Cable End Fittings are perfectly matched to CableView Railing™ aluminum post and handrails as well as many other types of deck railings. Whether you are planning a deck or balcony, we hope you choose STAINLESS CABLE & RAILING™ Cable End Fittings for your next cable rail project.